Innovox Audio has selected Powersoft amplification modules for use in its Flex Synergy modular AV loudspeakers and HLA Family Hybrid Line Arrays. 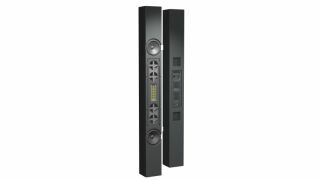 Innovox, which specializes in loudspeakers for visual display support applications as well as houses of worship and small to midsize theaters and auditoriums, chose the Powersoft D-Cell 504 and DigiMod modules for their products due to their sound quality, compact form factor, and advanced DSP integration. The modules help Innovox achieve their loudspeaker design goals, enabling their products to consume as little space as possible while delivering clear, powerful audio in a range of environments. Innovox’s Flex Synergy system is a modular corporate AV solution that allows a customizable array of components, including Innovox’s compact ribbon high-frequency drivers, low-frequency drivers, and mini-subwoofers, to be combined into a frame-like apparatus. The frame can be attached to a media screen and is sized to fit; applications have included media walls and screens upwards of 30 feet in width. Powersoft D-Cell 504 modules are installed within the frame for a completely self-contained audio delivery package and are technician accessible via a removable front grille. “Speech intelligibility is of critical importance in these applications, as often they are related to videoconferencing solutions, and Powersoft amplification combines perfectly with our proprietary speaker design to allow listeners to decode the complex information presented,” Oswood said. The HLA Family of loudspeakers covers Innovox’s theater, auditorium, and house of worship markets, the largest environments for which the company designs loudspeakers. Here, the high output and clarity of Powersoft’s Digimod amplifiers is critical to the success of Innovox’s designs. As with the Flex Synergy line, intelligibility of speech remains a focus for Oswood and the Innovox team. The HLA Family utilizes Innovox’s own loudspeaker technology, featuring arrays of ribbon high-frequency drivers and compact midrange drivers, further refined by the DSP embedded within their Powersoft modules. All of Innovox’s loudspeaker lines are built to order, allowing the company to select the ideal module based on the application and project budget. “With the HLA Family, we use the Digimod 3004 most frequently, with DSP 4 and DSP D depending on performance requirements,” Oswood said. Innovox can also build units as passive loudspeakers for use with Powersoft rack amplifiers, preloading the rack amps with the exact Armonía presets they use on the Powersoft modules to ensure the same plug-and-play performance.